Have you noticed that whenever the World’s media, especially the British media, want to compare an area to something, they always choose Wales? As in “The part of Arizona affected by the recent drought is roughly half the size of Wales.” Or “The total area of fields growing opium poppies in Afghanistan is twice the size of Wales.” Is everyone in the world intimately familiar with the size of Wales? 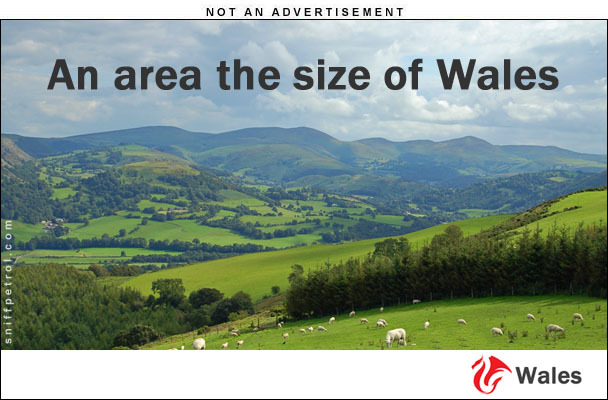 Does the population of Wales even know the size of Wales? Well, according to Wikipedia it’s 20,779 square kilometers. So now you know. You see, the other day I was thinking – I do that from time to time – about the extent of the recent and ongoing flooding, not only in my own part of Thailand, but all the way down the east coast of the Peninsular, to the bottom of Malaysia. I figured, as a rough estimate, the flooding extended an average of fifty kilometers inland – here, only about 15kms, but further south more than 100kms. I reckoned that must be an area roughly the size of Wales, which, given that the water was anywhere from one to four meters deep, would be a scary amount of water. The size of Wales according to the satirical motoring website Sniff Petrol! The flooding extended a little ways north of here, and so the distance down to Johor Baru would be about 1200kms. If my estimate of the inland penetration, 50kms, is about right, then the total area of the flood would be some 60,000 sq.kms. … and that’s three times the size of Wales. Which is a really scary amount of water. “But, what’s that in volume?” I hear you ask. Well, a recent BBC News article about the world’s largest container ship said it could hold 19,000 standard twenty foot containers, or 900 million cans of baked beans. Yes, really. They wrote that. So, it would seem just as the standard for comparing areas is Wales, the standard for volume is cans of baked beans. Now, I won’t bore you too much with the math, but if we are to believe the BBC, you can get 47,368 cans of beans in a container, and the volume of a container is 38.5 cubic meters. So, a baked bean can will hold 0.00081 cu.mtrs. … of water, or beans! Now, if the average depth of the flood was one meter, that’s about 60 million cubic meters of water, or … wait for it … 74 billion cans o’ beans. Actually, my trusty calculator assures me it’s 74074074074 cans. Which is about as bizarre as my twitterings. Please don’t ask me what’s the weight of all that water in elephants. Where I am, it’s not too bad. The land is drying, but the rivers remain high. About ten days ago I went to Surat Thani, and fortunately the main highways are raised, otherwise I wouldn’t have reached there. On one stretch of road, for about thirty minutes, it was like driving across a lake. There was no sign of land. Just water. Yesterday I was out and about, and there was no longer any sign of flooded land, so things are improving. Here, the house is eerily quiet because I’d become accustomed to the noise of the crashing waves, but now the sea is returning to its more normal placid state. Usually, it’s so calm it’s hard to believe it’s the sea. Further south though, Malaysia is struggling to recover. Tens of thousands of people are still homeless, and as the floods recede, they leave behind a sea of mud, soaking wet furniture and possessions. The losses run into the billions – in a currency of your choice. But back here, maybe soon I’ll return to touring mode, to bring you some new travel stories. Last week there was one nice day, so I ventured into Khanom for lunch. 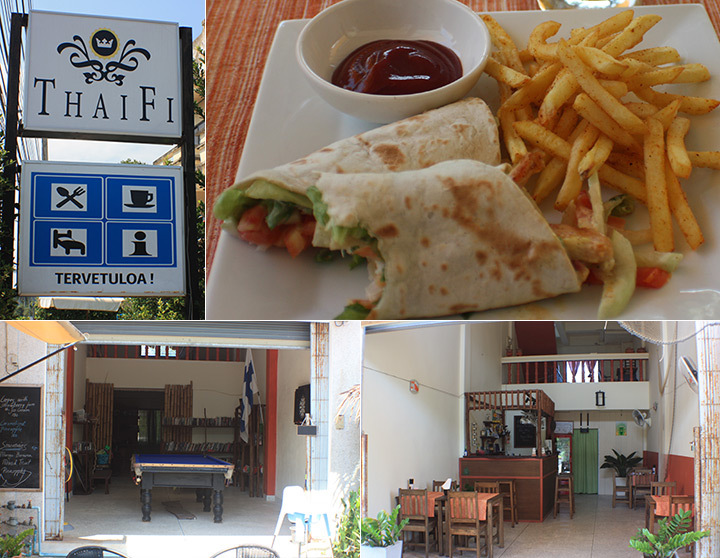 A Thai-Finnish owned restaurant that was highly recommended. It was nice, but nothing special. Maybe better in an evening. And, I’d rather have a sea view, so I won’t be going back there any time soon. In any case, it’s only 26 days until I start my giant tour of western Thailand with the Road To Mandalay Rally. I hope to have daily updates for at least two weeks, during which I will cover an area about ten times the size of Wales!